"Prayer is listening to the heart beat of God"
"Prayer is looking for God at the heart of everything"
"Prayer is us inviting God to listen to the beat of our hearts"
a. Can you map your sermon to IPREC? b. Are any of these items missing? c. What might you want to add to bolster any of these items? The contemplative life is central to Father Michael’s life as a monk, a preacher, a retreat leader and spiritual director. a. As a preacher, what are the different ways you purposely help others work out their identity in God? i. What devices and techniques are you conscious of using in a consistent way that you feel help you do this? ii. Are there things you want to try? b. As a follower of Christ in lay life, how are you working with the Word of God to create your life and work out your identity in God? i. What has been working well for you? Can you do more of this? ii. What other things might you introduce into your life of faith to participate more deeply in creating your life and working out your identity in God? a. What are you strengths as a performer? b. What comes natural to you? c. What did you observe in Father Michael’s performance? d. What have you observed others do that you found effective? e. Identify one new thing you will try in your next sermon to increase you effectiveness as a performer. Using stories is a well-known sermon technique. Father Michael uses them in a unique way. His stories invite people to go on a contemplative journey. a. What’s different about the ways Father Michael uses stories? b. How can you use stories to incite more reflection? c. What role does vulnerability and authenticity play in using stories in sermons? d. Consider your next sermon. What story can you use to promote reflection? a. What do you think he means by half ideas? b. What might the dangers be of using half ideas? c. How can you use symbols in your sermons? 6. 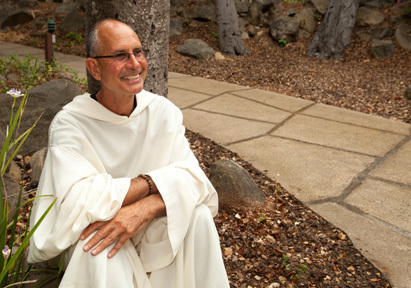 Father Michael divides his time as a contemplative modern monk living outside of the Camaldolese Hermitage, leading retreats and serving as Spiritual Director. a. How would you characterize the link Father Michael sees between preaching and spiritual direction? b. What principles of spiritual direction do you use as preacher? c. What are some new ways you might incorporate more principles of Spiritual direction into how you craft and deliver sermons? Father Michael says the preacher at some point should become, “redundant,” and get out of the way of people as they find their way. d. What things do you do as preacher meet people where they are, to get out of people’s way and redirect them? e. What’s one thing you can do in your next sermon to put this principle to work? Walking is part of Father Michael contemplative life style. He is always on a journey. He has walked the Camino de Santigao five times. Daily walks are part of his rhythm – as is the habit of saying mass for himself at the end of the day before his meal. It is sacred time spent in communion with our Lord and in the Body of Christ. Father Michael’s mass in the video occurs in the context of a four day silent retreat. Participants have been gathering for talks and then spending time reflecting in silence. Father Michael begins mass in a beautiful way and this a part of who and how he is as a contemplative. He points out the time of day and invites people to enter into their imaginations. He draws us into the scene in Genesis of Adam and Eve walking with our Lord at dusk every evening in the Garden of Eden. They share with God their adventures in naming and coming into relationship with God’s creations that He has put in their care. Father Michael bookmarks this story with another walk; the story of the Emmaus (Luke 24:13-53). As Christ is ready to take his leave of the two on their way to Emmaus, they invite him to rest and eat with them. Father Michael gently opens the mystery of mass with stories, symbols and imagination. He asks participants to bring their personal encounters of Christ’s Word working in their hearts and minds to the Eucharistic meal. For the purposes of this retreat participants’ individual contemplative experiences become the Liturgy of the Word. a. How might you begin your next mass with stories, symbols and imagination to help people have a more contemplative experience? b. Think of stories and images that will stimulate the growth of tendons and ligaments to the muscles of the Liturgy of the Word and the Eucharist. Abba Father, Shepherd of our Hearts, Beautiful Spirit of God help us to accept your invitation to walk in the garden of contemplation. We place our gifts, experiences and faculties in your hands. Transport the sacred imaginations of our hearts that we might encounter you in new ways. Amplify the sounds you whisper in our spirits. Grant us a new path of insight and that emerges from entering your space of silence. Guide the fruits of our work as your preachers and as your people of faith. Show us how to better connect and relate to all of your creations through the faculties of our mind, heart and spirit. Invigorate all of the things we do to create rich opportunities for study, praise and worship with our brothers and sisters in Christ. We ask these things in the name of Jesus Christ our Lord and Savior. AMEN.